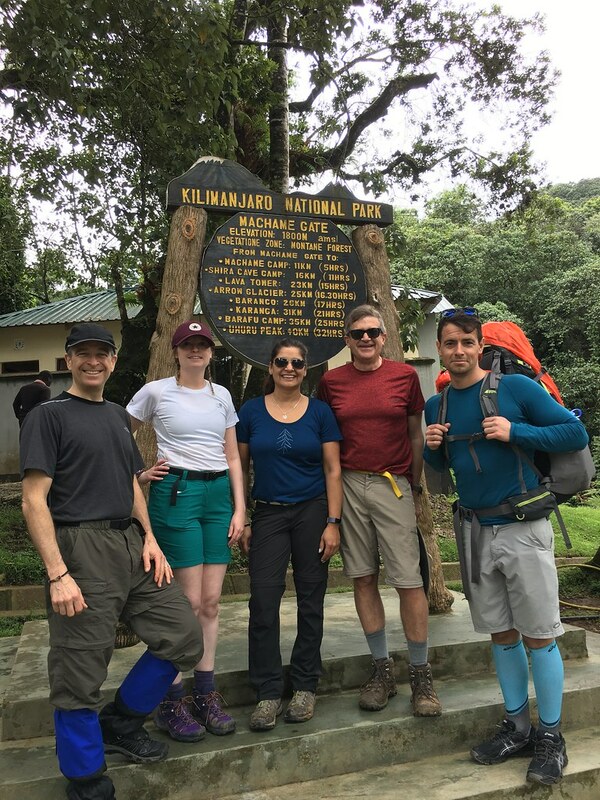 Follow our team as they climb to the "Roof of Africa"
WaterAid Canada's Kilimanjaro Climb for Life 2018 team has conquered Mount Kilimanjaro! They walked in the footsteps of famed explorers and mountaineers on their way to the top of Africa's tallest peak - towering at 5,895 metres above sea level. They hiked through lush rainforests and alpine deserts; cross glaciers by day and slept under the stars at night. You can see more of their journey! Search for #ClimbWithAdam and #Kilimanjaro2018 on Facebook, Twitter and Instagram to see trip photos, live videos, reactions and stories from Tanzania. Following a successful summit, Kilimanjaro Climb for Life team members visited WaterAid project sites in Tanzania, where 23 million people lack access to clean water. Women in Tanzania typically spend more than two hours a day collecting water, and up to seven hours in remote areas. The team got the opportunity to see how their fundraising efforts are changing lives. We are deeply grateful for the financial and in-kinds support of the following companies that have helped to make this campaign such a great success! Get to know the team who have been working hard over the last few months to raise $100,000 before they traveled to Tanzania and conquer Mount Kilimanjaro. My name is Adam van Koeverden. I’ve had a long, fulfilling relationship with water. Not only is it my favourite drink, but as an Olympic paddler, water is a fundamental part of my life. Recently, I visited Madagascar with WaterAid and I learned something new about water, I learned what it is like for the 650 million people around the world who don’t have access to safe water to drink. While in Madagascar, I went on a water trek with one woman. I knew that while there was no way I could ever truly understand her hardship, I thought that being part of her ritual would give me a better appreciation of what she goes through every day. As I walked with her, I couldn’t believe how hard it was! I learned, first hand, what it is like to waste precious time walking long distances to collect dirty water. But, I also know teamwork. And I know that if we all work together we can transform lives with clean water, decent toilets and good hygiene. How better to show how important I believe this to be than by joining the team who will tackle WaterAid’s Kilimanjaro Climb for Life in support of clean water projects around the world. David has been a long-standing Board member of WaterAid and is now serving as its Chair; he is also a Trustee of London-based WaterAid International. As Principal of his own consulting firm, DMci Strategies, David is a strategic advisor, speaker and facilitator on change and opportunity facing the global food system and is the former President & CEO, the Canadian Agri-Food Policy Institute. Previously, David has worked at Canada’s largest life sciences company, a national business association, a chartered bank and for a Royal Commission. David has been a director of several organizations involved in local economic development and is a published author. He is a graduate of the London School of Economics and Dalhousie University. Initially from Halifax, David lives in Ottawa. Razina is a Senior Organizational Change Management Professional with more than 20 years of Management Consulting experience attained in senior leadership roles at EDS, Pricewaterhouse Coopers, IBM and, since 2003, as the Founder and Principal of Cocentric Solutions, a Calgary, Alberta based senior management consulting company. Razina is a certified executive coach who currently coaches and manages effective change at all levels, from executives to end users. Her change management expertise has successfully impacted stakeholders in small and large groups ranging from 10 to as many as 90,000 on a single project initiative. She also leads Change Management training, workshops and seminars globally and is regularly scheduled for speaking engagements. Razina has always wanted to climb Mount Kilimanjaro and is excited to do this now and with WaterAid! Making a difference in the lives of those that need clean water energizes her. She feels fortunate that being Canadian gives us all our basic needs and more. Clean water is survival for others. I retired in June 2016 after a 35-year career as a tax and pensions lawyer. Hiking, cycling, cooking, photography and volunteering with church, Scouts Canada and the local performing arts centre fill my days. My wife is happy that I have found companions for my Kilimanjaro adventure because she doesn’t like camping! I am excited about this opportunity to combine my love of adventurous travel with raising funds for a worthy cause. Clean water and basic sanitation are essential for both good health and economic advancement. I am trekking Kilimanjaro to raise awareness of the significant need and money to provide accessible water to some of the world’s poorest people. I am an English girl living in Wales with 3 fur babies, Martha, Mitzy and Rosyton the dog. When I am not working you will either find me in the gym, getting my sweat on or with a glass of wine in hand! Life is all about balance right? I think it goes without saying that the charity aspect of the expedition is one of the main motivators for wanting to take part. Unfortunately we live in a world with such inequality that we have to make the most of opportunities like this to bring ordinary people together to make a real difference. On a personal level I want to take part as I want to push myself physically like I have never done before. We’re changing lives for the better in 35 countries around the world.